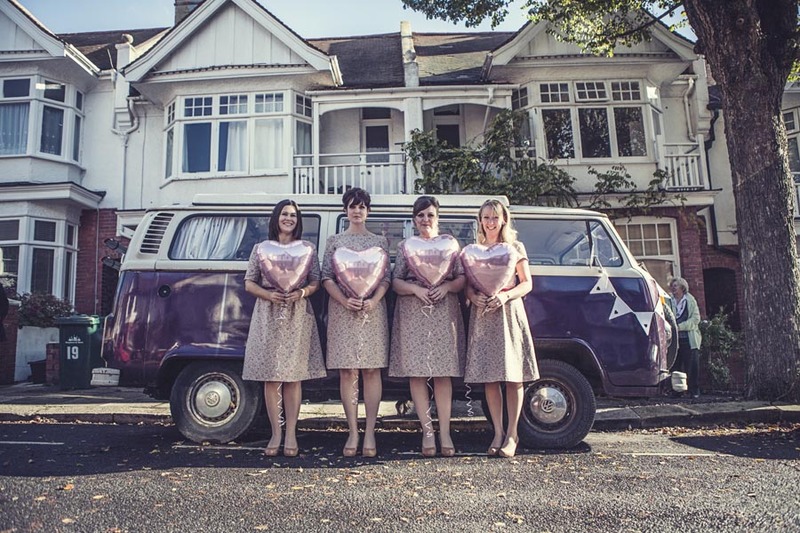 ← Cool Brighton Wedding Sneak Peeks: VW Campervan, Lace Wedding Dress & Heart Balloons. 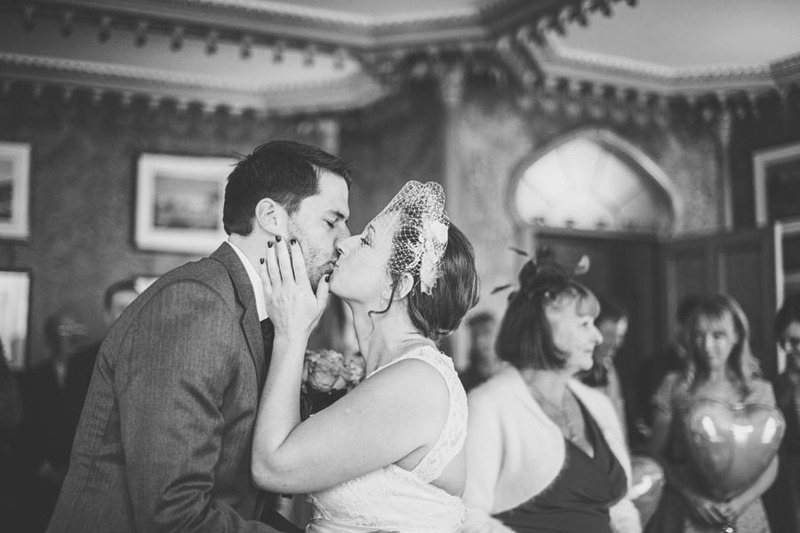 Katie and Brad from Hove held their wedding at Brighton Royal Pavilion followed by a reception at The Hove Club just a few months back on the 3rd of November 2012. 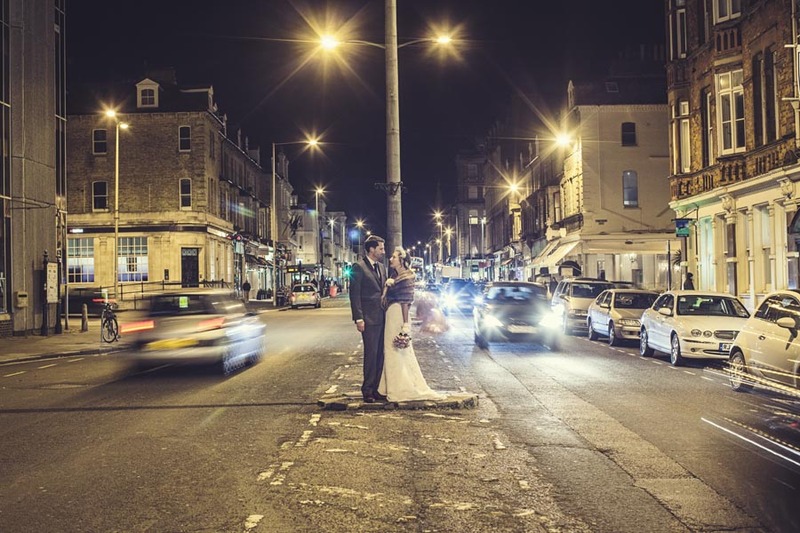 They sourced most things for their wedding in Brighton and went for a relaxed and alternative vibe. 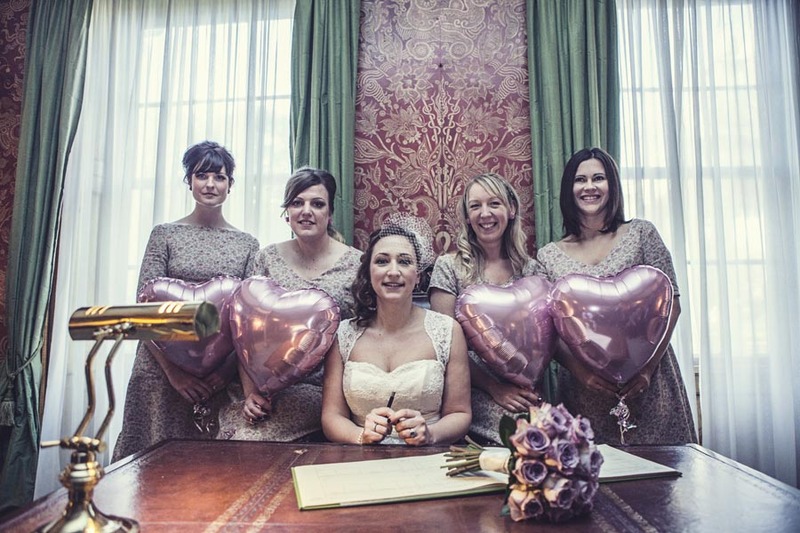 Their gorgeous photos today are by the ever so fabulous Emma Lucy Photography. 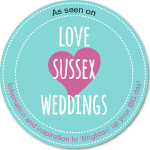 “We live in and love Brighton (Brad is born and bred Brighton!) so it seemed the natural choice to marry in our home town/city. We got married on the four year anniversary of our first date. 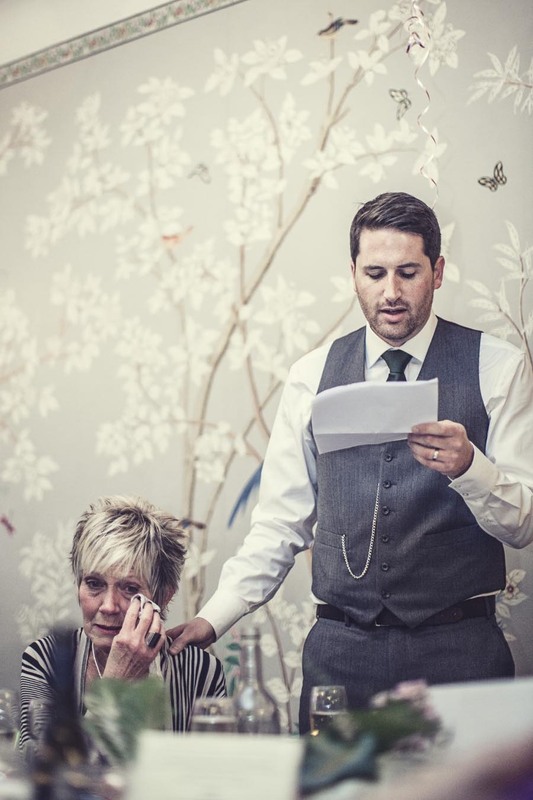 When we picked up my engagement ring the jeweller cried as I was so overwhelmed when I put it on that I was pretty tearful! 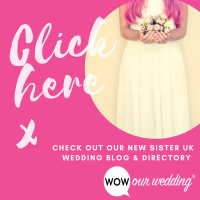 When planning my wedding I looked at a few blogs, avoided magazines and went by word of mouth for everything other than our photographer, Emma, who I came across online. 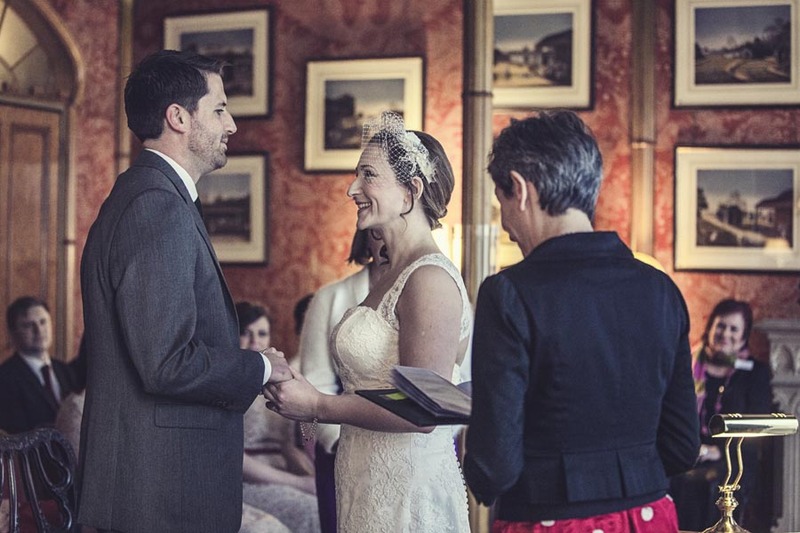 We had the wedding breakfast at Brighton Royal Pavilion after our ceremony and then had a wedding party from 4.30 pm at The Hove Club. 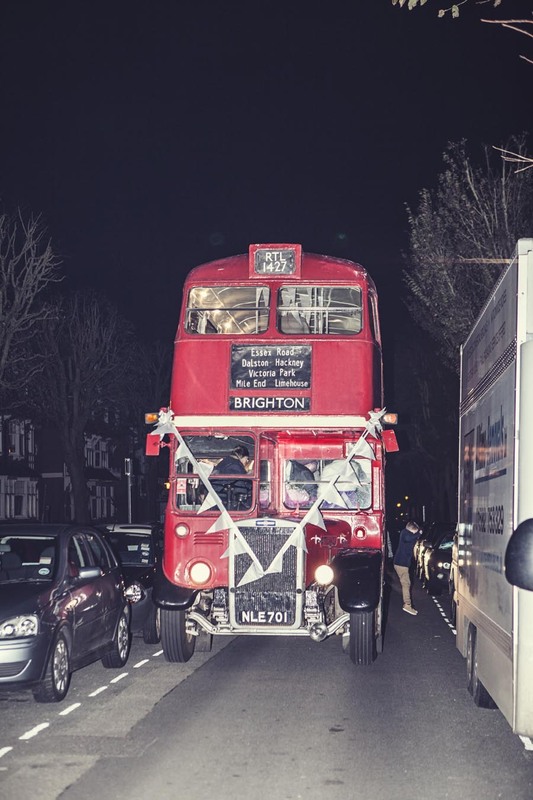 We hired a vintage bus to take our guests from the Pavilion to the The Hove Club. 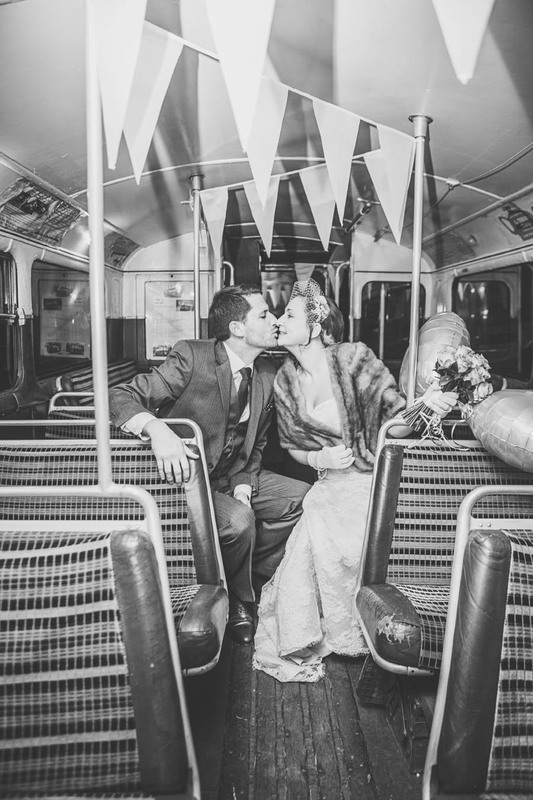 Our pictures were taken in the Laines around the Pavilion, in the vintage bus we hired and also on Church Road in Hove amongst the traffic! 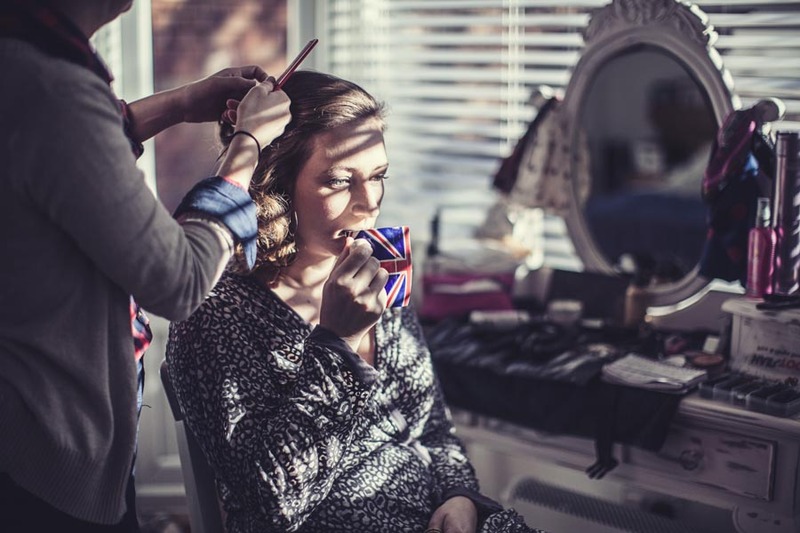 I got ready at home in our flat in Seven Dials and Brad got ready at a hotel in Hove where we stayed on our wedding night. 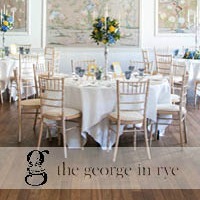 Our wedding theme was relaxed, alternative and British! We also wanted to try and source everything in and around Brighton. 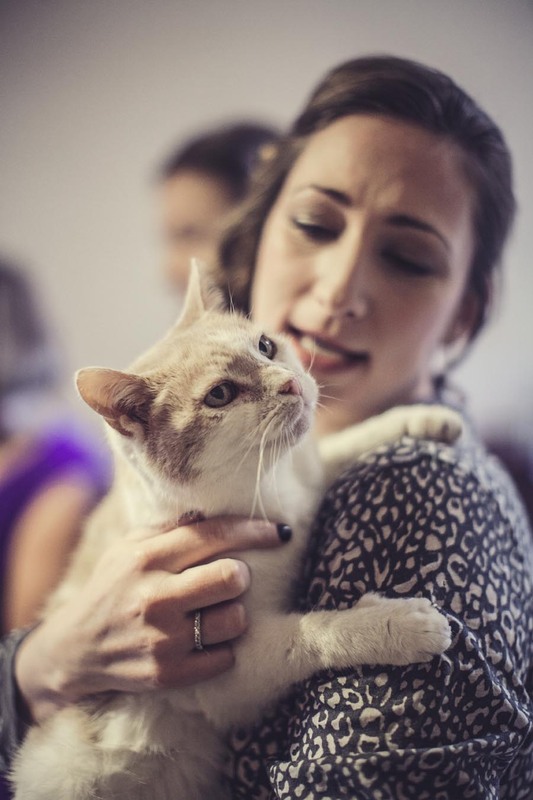 Our wedding photographer was Emma Lucy, the best girl for the job! Fact. 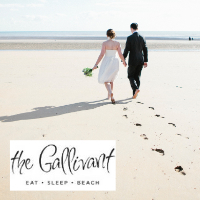 Brad and I both agreed that we didn’t want a ‘traditional wedding photographer’ but someone who was more creative and alternative at capturing the day for us. We absolutely adored our engagement shots so had high hopes for our wedding day. Emma was great fun to be around and made us feel so relaxed. The perfect recipe for great pictures! The pictures were everything we’d hoped for and a whole lot more, they captured the world of ‘us’ so perfectly. 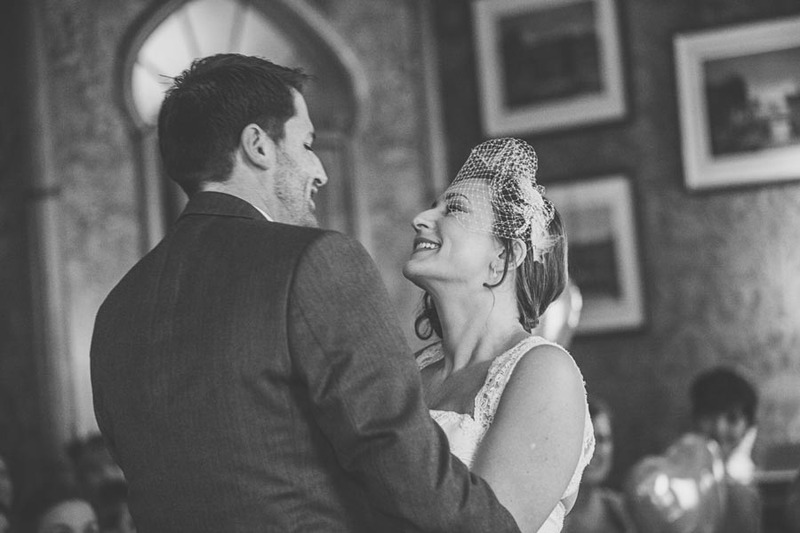 So many of our friends and family have commented on how amazing our pictures are and that Emma just slotted into the day. We were married by my old boss Fanny Bradbury. 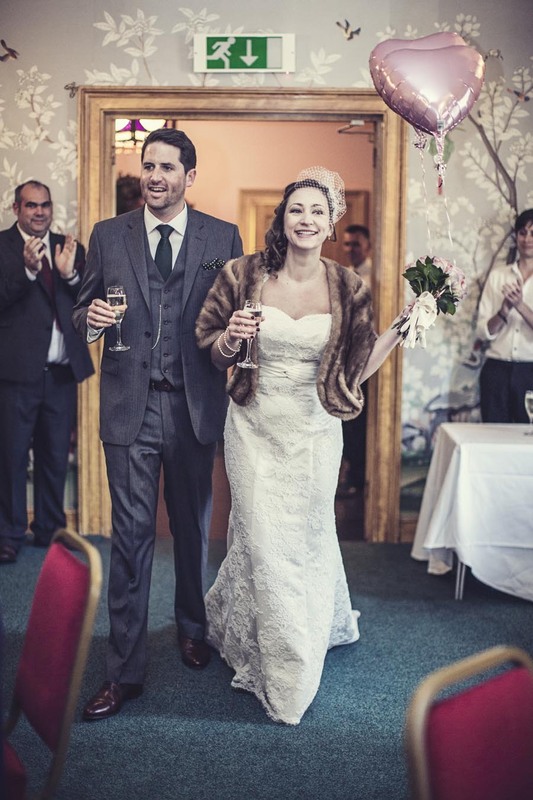 She’d only just qualified as a registrar and we were her fourth ceremony. The girls were going to keep it a surprise but thought I might freak out when I saw her in the room so I was told the week of the wedding that she was conducting it. I’ve known her for about ten years and being married by someone who knows you well is just magic, it made it so much more special and personal. 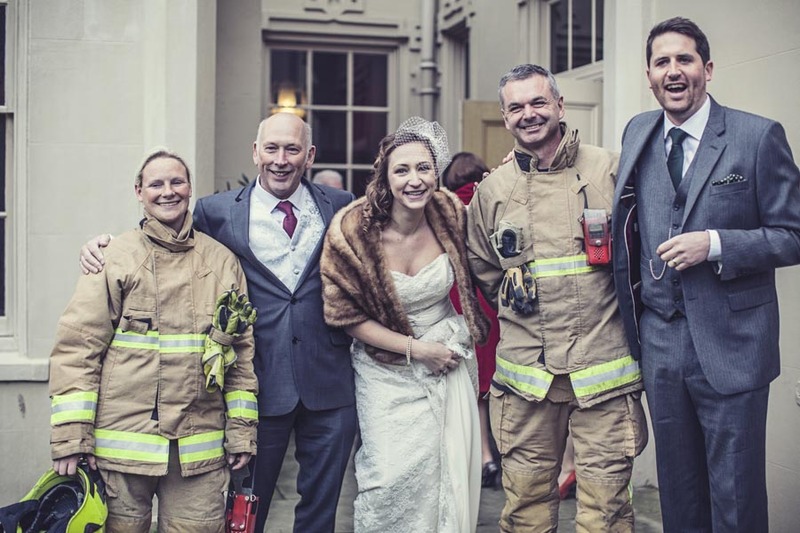 On our wedding day we had to be evacuated from the Pavilion as the fire alarms went off and we waited 40 mins for the fire brigade to arrive and give us the all clear! Our amazing cake was designed and made by our very talented friend Elle. We were stuck on ideas and gave her a brief of simply British and Chocolate. She knows how patriotic I am and also our love for our cat and Brad’s love for chocolate. The cake was a total surprise on the day and it was utterly beautiful! Not only did Tommy cat feature but once you’d cut open the top tier it revealed red, white and blue layers of sponge inside. Brilliant! To top it off it tasted incredible. Brad doesn’t like flowers so I had a challenge on my hands! 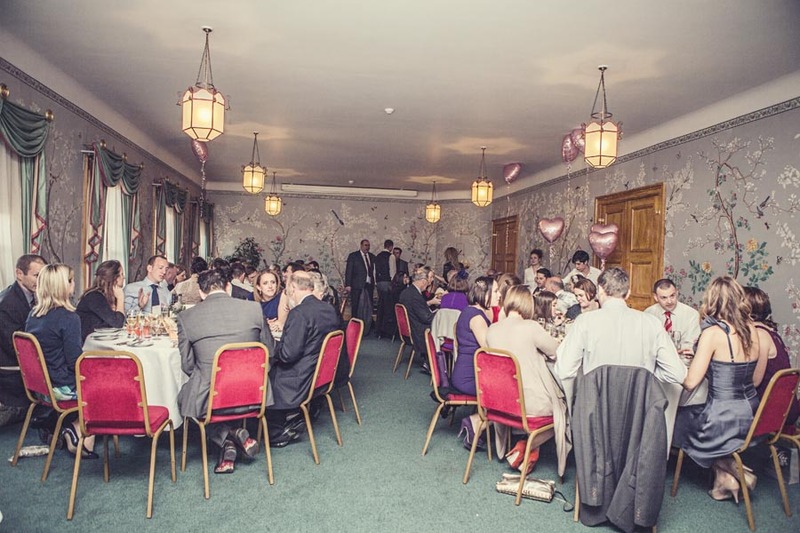 I’d already had a random idea for the bridesmaids to use heart shaped helium balloons and had my heart set on memory lane roses for me in a small posy so it was really the decision around what to put on the tables for the breakfast that we needed help with. 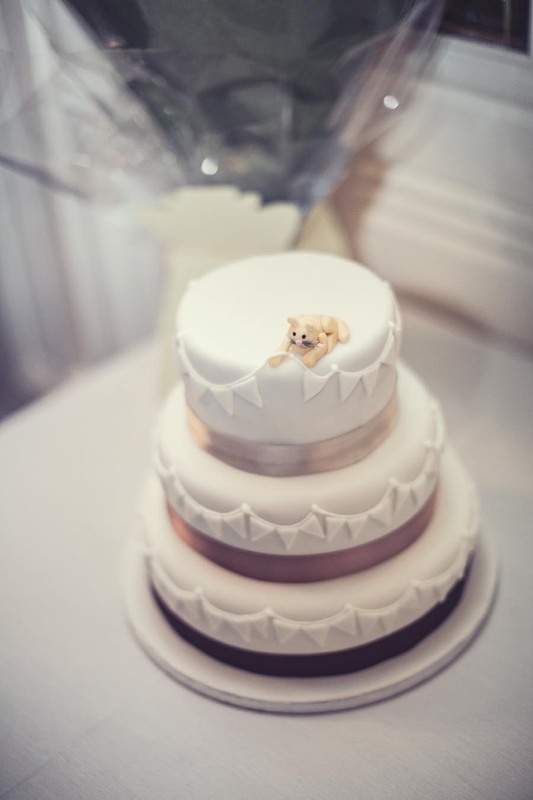 Miss Mole’s was recommended to me by my friend who made our cake and she was the only florist we contacted. On my first meeting there I knew she was the right person for the job and didn’t want to look anywhere else! 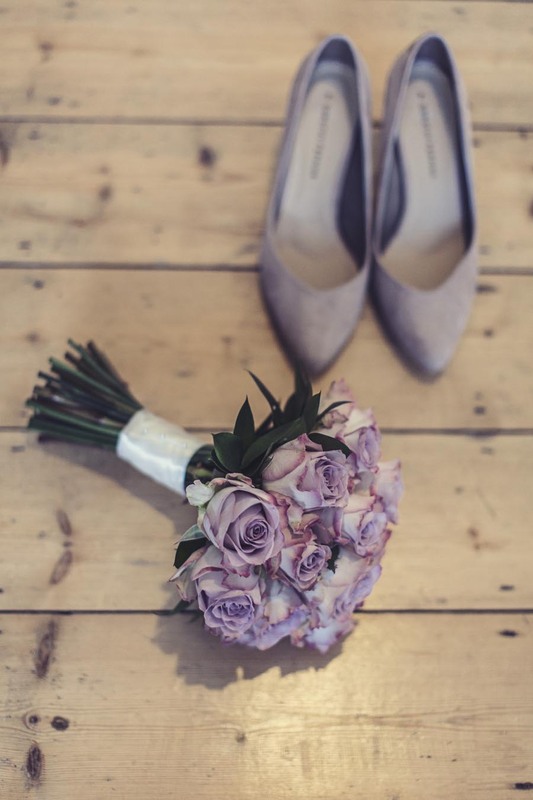 I probably should have compared some quotes with other places but once you know you know and Barbara was amazing at overcoming the ‘no flowers policy’ and coming up with other fantastic ideas. In the end we settled on, vegetables! She sourced some blue pumpkins for me to look at that matched the colour of the walls in the Pavilion and we looked over various ornamental cabbages and hydrangeas and came up with the perfect look that thankfully Brad loved, we even ended up using the newly named ‘minikins’ for our favours/place names. It was all very seasonal and British! We didn’t make anything ourselves but we bought old Brighton postcards from Brighton’s North Laines that we used as invites. The headache came in how we got all of the info onto such small cards! 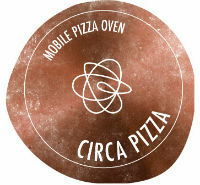 (We ended up having stickers printed that we stuck to the back). 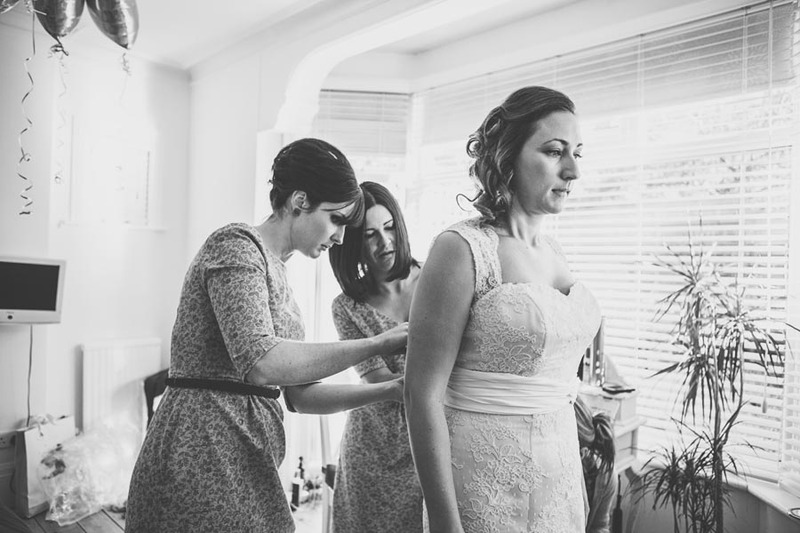 I also ended up finding a dress maker to make the bridesmaid dresses as I wanted them to all have a different style dress so that they were comfortable in what they had. This meant fabric shopping which I knew nothing about but Suzi (the dressmaker) was awesome. We had the stickers (printed for the post card invites) done at 4 Print Design who offered great design options and at a fair price. They have also just arranged our thank you cards. 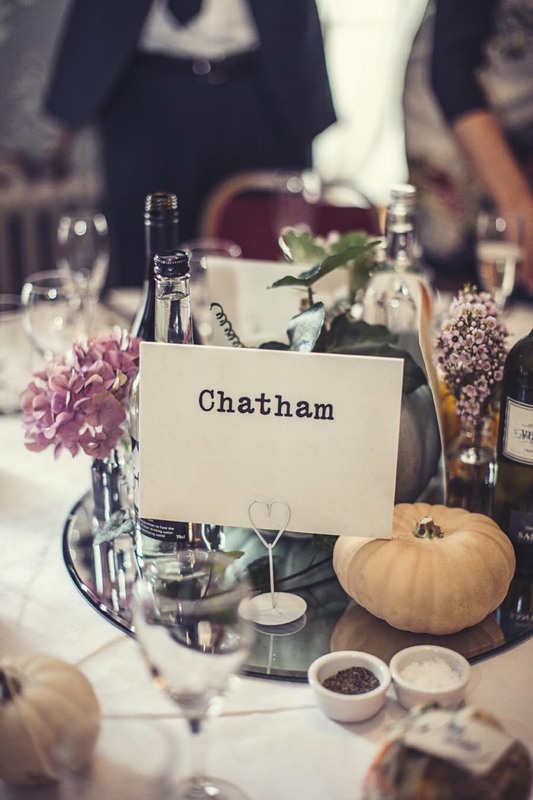 We also really wanted to avoid the whole ‘structure’ of a traditional day and scrap the idea of the ‘reception’ so we had a wedding party instead that started at 4.30 pm and had guests waiting to greet us at the Hove Club when we’d finished at the Pavilion. 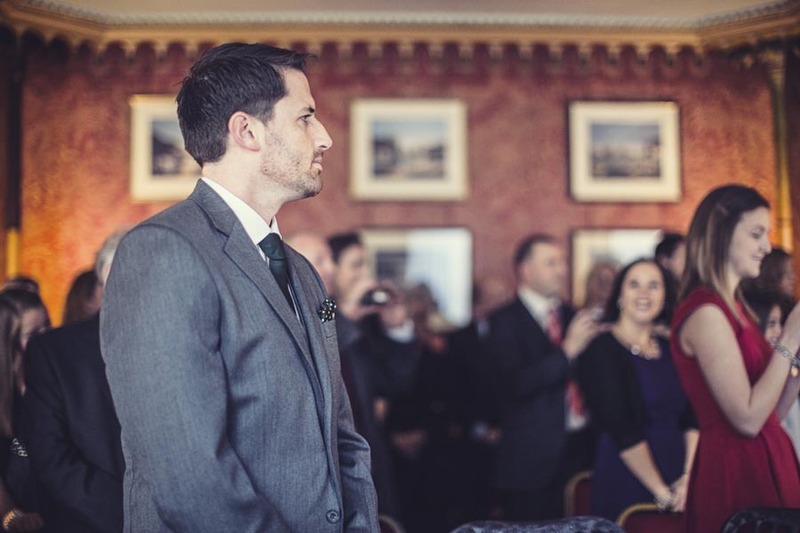 We wanted them to be as much a part of the day as the people who had seen us take our vows. 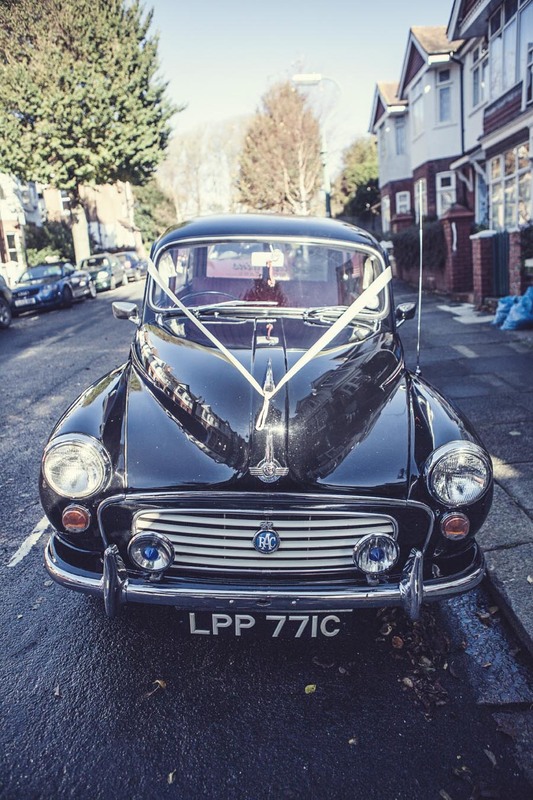 We’d loved to have used our classic MG for the wedding car but logistics ruled that option out so instead I had to hire a car, only condition was that it had to be British! So we booked a Morris Minor through Paladins Classic Cars. 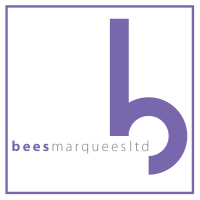 As it was within budget I didn’t shop around.They provided a great service and our driver was lovely. For the bridesmaids I asked my neighbour if she would drive them to the Pavilion in her purple VW camper van, complete with bunting. The colour went very well with our autumnal wedding and we officially have the best neighbours ever! (Saved timings of several trips with one car and also kept cost down). 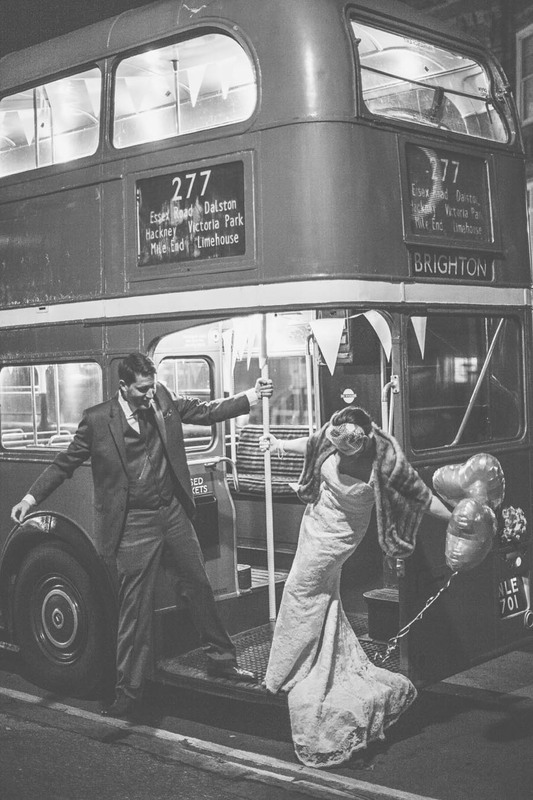 Lastly, to take our guests from the Pavilion to Hove Club, we hired a 1960’s vintage bus from Pavilion Coaches. 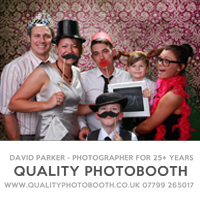 It was great fun and a highlight of our wedding day, as everyone loved it. We went the scenic drive to Hove along the seafront and had 60’s music blaring out. The pictures we had taken on the bus are some of my favorite from the day. 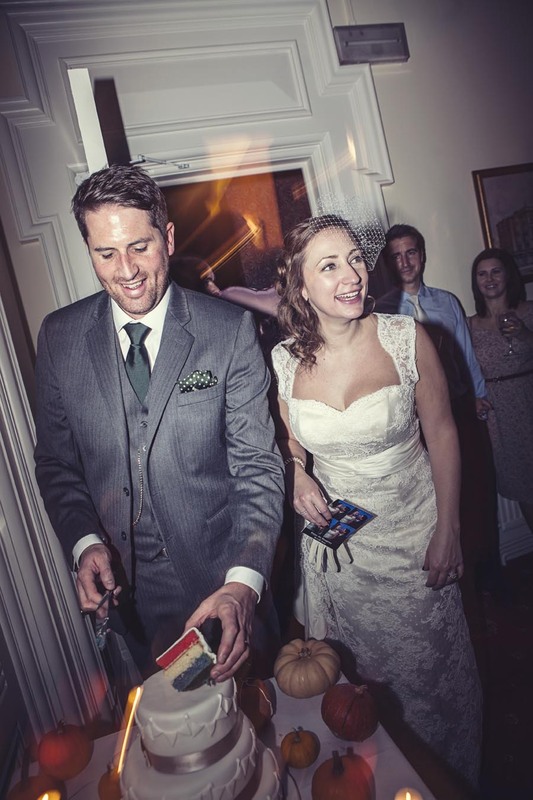 We did quite a few things differently at our wedding, for one we had marmite on toast at the end of the night! 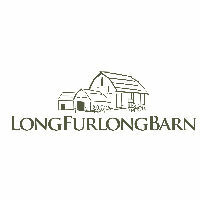 The best bit of planning the wedding was planning the Honeymoon!! 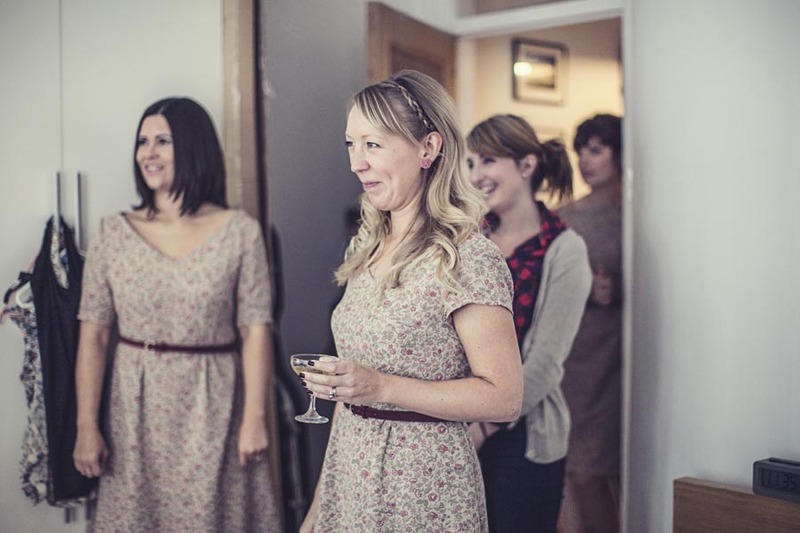 I also simply loved putting my dress on and the adventure of finding it. As we wanted something different I really enjoyed looking at the alternative options out there and Brighton is just the right place for it. The trickiest bit of the planning was having to squeeze such a small amount of friends and family into the Pavilion (it holds 44 so 22 each!) It was really tough having to choose between people etc. but thankfully I have understanding friends. If we could do it all again we would. 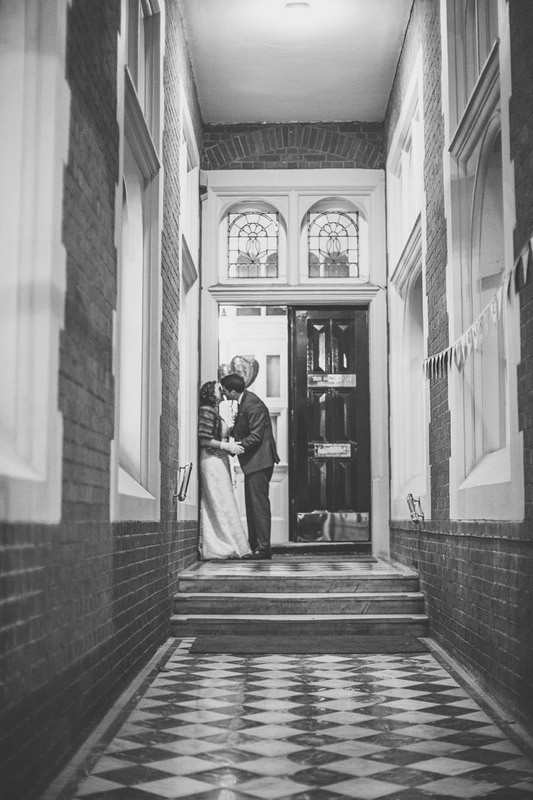 . .
We would love to do it all over again just as it was… even with the fire alarm it made for such a memorable day. To have all the people you love all together in one place was just magic, there is nothing quite like it! 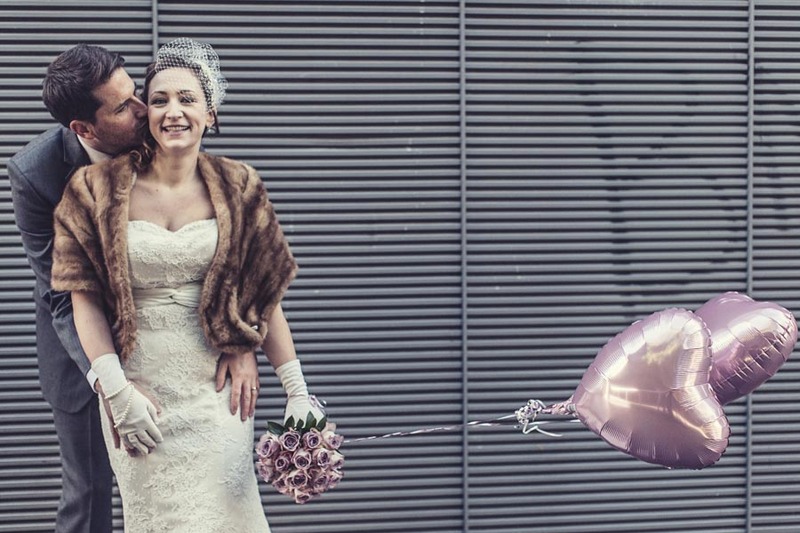 Love, love, love this Brighton (and Hove actually) wedding. 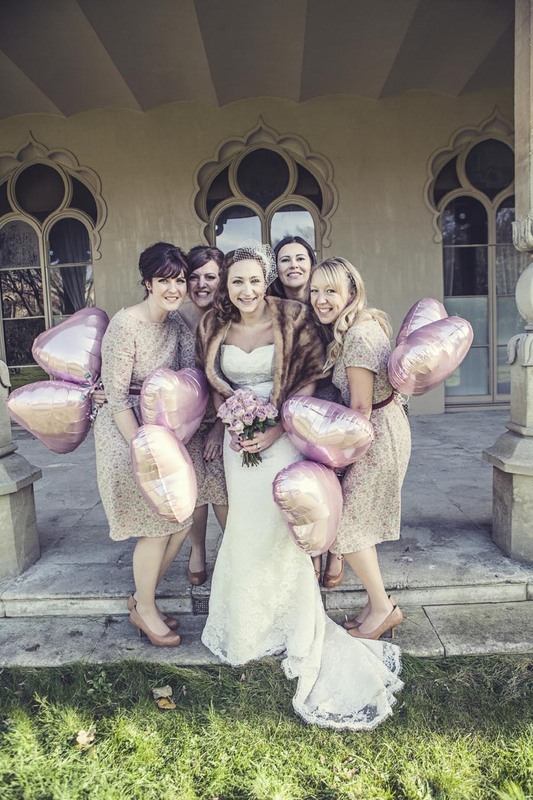 What with the pink heart balloons and the bride’s romantic lace wedding dress I was originally planning to feature this wedding on valentines day, but just couldn’t wait! 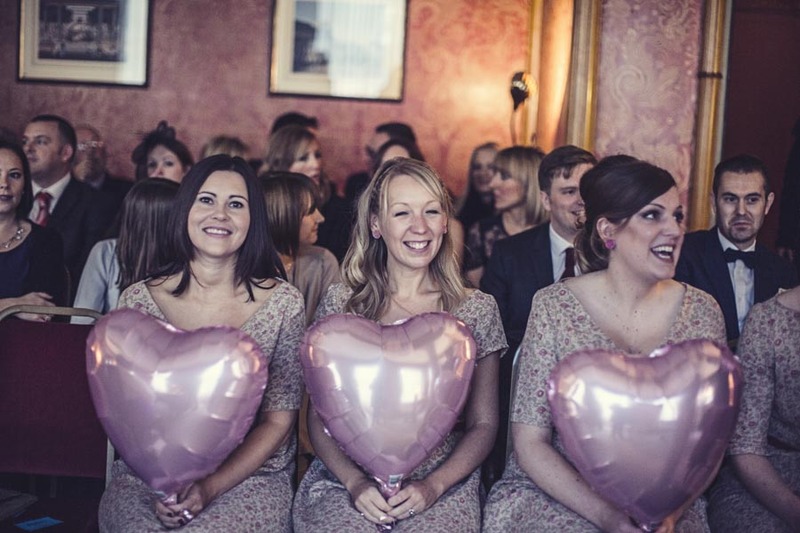 So much to gush about here: the heart balloons (love! ), the cool VW Campervan, the bus and Morris Minor, the lush venues, the blue pumpkins and last but not least the marmite on toast: late night food of the gods (an old fried of mine made a mint at Glastonbury festival one year selling marmite sandwiches to hungry revellers). 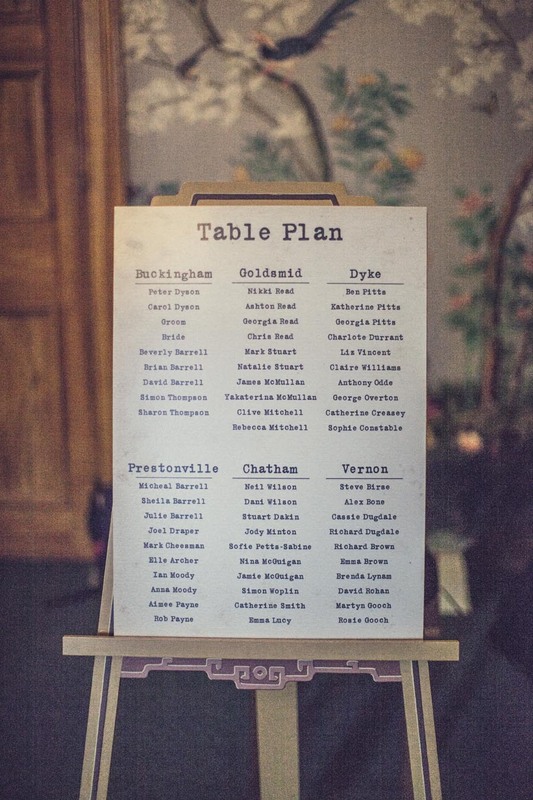 Wedding toast stations, now that could catch on! 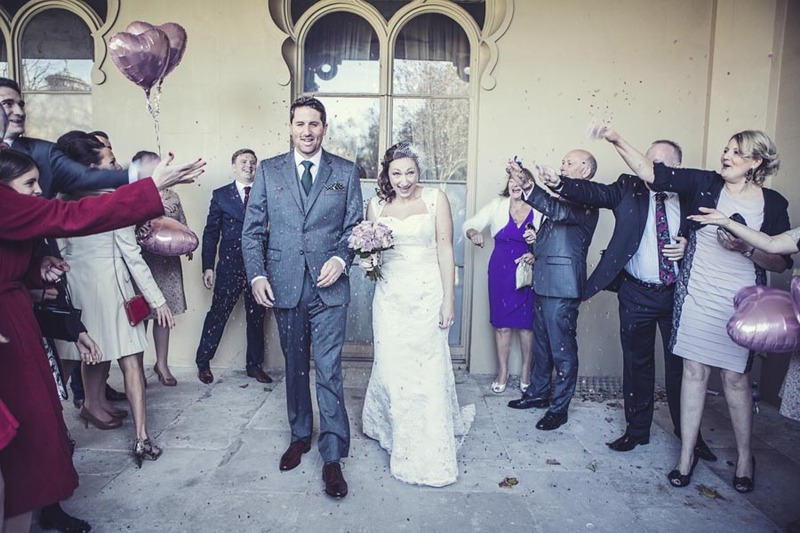 OK, so, more gushing to come when we feature part two of Katie and Brad’s wedding next week, where we will hear all about the lovely outfits, their funky wedding reception and their uber amazing honeymoon. 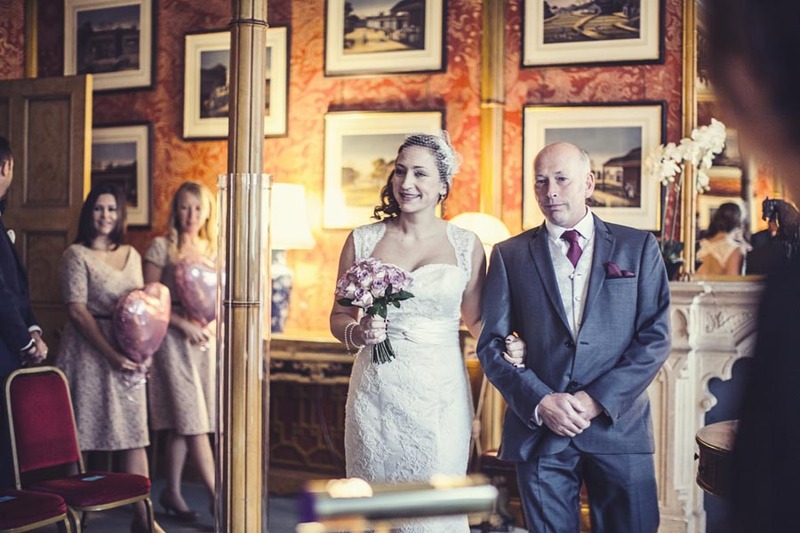 Big thanks to Katie and Brad for sharing their wedding with us and to Emma Lucy for sending over her fab work. 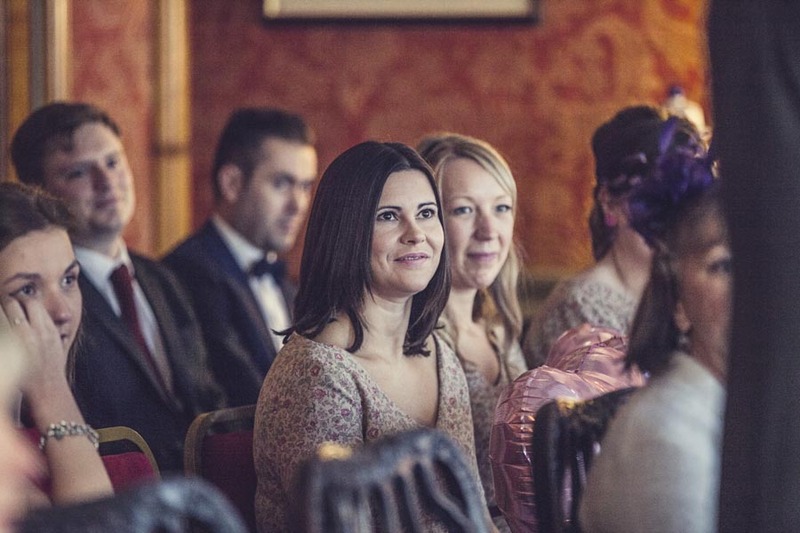 If you are in the mood for a bit more wedding reading today why not check out a couple more Royal Pavilion weddings that we featured last year: A Japanese Themed Wedding and an English Themed Wedding. 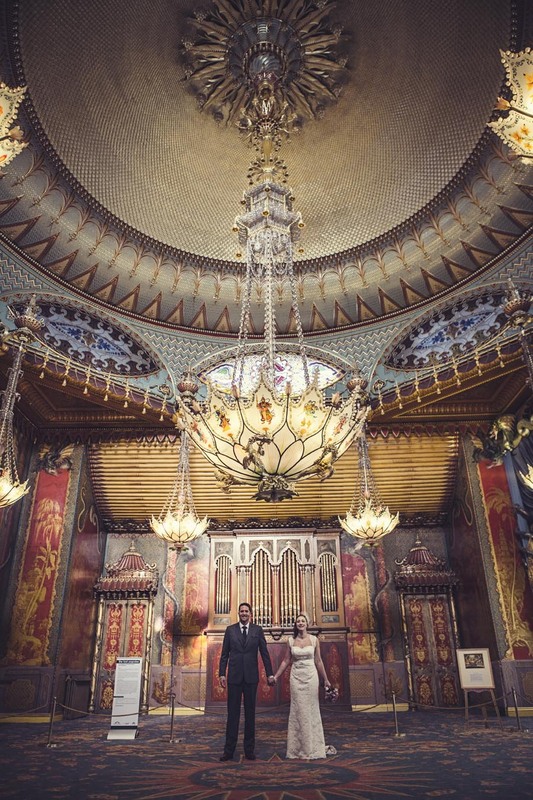 Such an amazing Brighton venue! 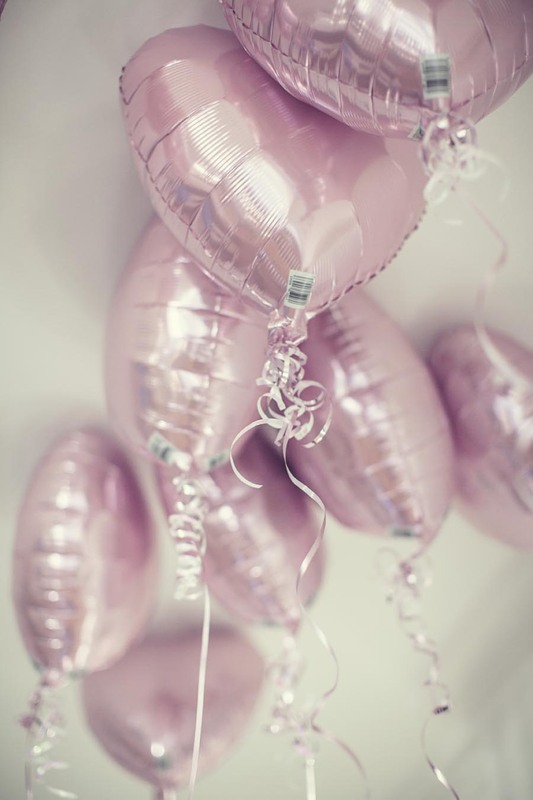 Please pretty please, where are the gorgeous balloons from? !